← Abbott to Students: You’re Not Invited! Kuff is back at it with interviews of some of our November candidates. Today, he featured my friend David Rosen, Democrat for County Treasurer. 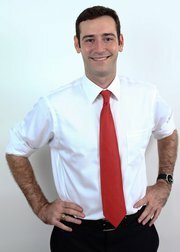 David is young, energetic, and wants to bring some transparency to the way business is conducted in Harris County. Give his interview a listen and then vote for him in November. This entry was posted in Democratic Stuff, Elections, Harris County and tagged county treasurer, david rosen, Harris County. Bookmark the permalink.